provided I know the current is a step function with amplitude A ,I'm asked to perform FFT on the data from the csv file and plot the Impdance Z on a logarithmic scale of the frequency f.
I have absolutly no idea where to begin so if someone fould provide direction i'll be grateful. This looks like a fairly straight forward RLC circuit. 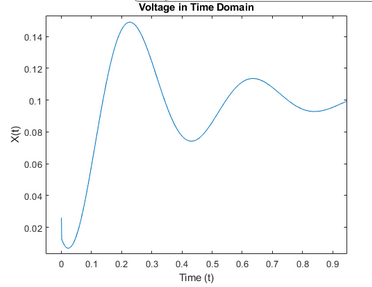 You can try to model this and try to identify the parameters by matching the modeled step response to the measure one. The R can be determined from the steady state part of the step response, the L from the damping time constant and the C from the resonance frequency. Not the answer you're looking for? Browse other questions tagged fft dft or ask your own question.